MR. HEALY: As I think I mentioned last week, a lot of the material the Tribunal is dealing with is live material or concerns live issues or live controversies, between, in this case, Mr. Lowry; and, in the last case, Mr. Haughey and the Revenue Commissioners. While the Tribunal is going to look into all of these matters, and notwithstanding that there may be time pressures, they are going to be ventilated at a public sitting. Obviously the more time the parties have to deal with these matters without, perhaps, intervention by the Tribunal, the better. So it was to ensure that the sittings could be efficiently conducted, without precluding the Revenue and Mr. Lowry from dealing with their affairs, that these last minute difficulties arose. In today’s sittings, and perhaps going into tomorrow, the Tribunal will be dealing with Mr. Lowry’s relationship with the Revenue Commissioners. That relationship involves dealings with a number of different sections of the Revenue, and the Tribunal will be focusing in the main on his dealings with the Revenue Commissioners through the Investigation Branch. Reference will also be made to his long-term relationship with the Revenue Commissioners through his dealings with his District Inspector, and also, a certain amount of time will be devoted to the dealings he had with the Revenue Commissioners in connection with Residential Property Tax. As I said, the main relationship Mr. Lowry now has with the Revenue Commissioners is being handled by the Investigation Branch. This is not, in fact, as a result of the work of this Tribunal, the McCracken Tribunal or the report prepared by Judge Buchanan and, in fact, I think, as I mentioned last week, the Revenue Commissioners’ recent dealings with Mr. Lowry or their recent relationship with Mr. Lowry since in or about 1996, and in particular his relationship with the Investigation Branch, predated the work of this Tribunal, of the McCracken Tribunal and the work of the inquiry carried out by Judge Buchanan. And, in fact, it would appear that the Revenue inquiry was prompted by the selfsame revelations which ultimately led to the setting up of those three inquiries. It seems that in November of 1996, the Revenue Commissioners received, from an informant, certain information concerning Mr. Lowry’s financial affairs. This information was apparently based on an extract from, or the contents of, an extract from the Price Waterhouse Report which had been prepared for the Dunnes Stores Group in connection with disputes between members of the Dunne Family and, in particular, between Mr. Bernard Dunne on the one part, and other members of his family on the other part, in the early 1990s. The information concerning the contents of the Price Waterhouse Report was brought to the notice of the Revenue Commissioners at or around the same time that newspaper articles were appearing concerning Mr. Lowry’s relationship with Mr. Bernard Dunne. On foot of the details of the contents of the Price Waterhouse Report provided by an informant to the Revenue Commissioners, the Commissioners subsequently sought and obtained a copy of, or, at least, a significant section of a copy of the Price Waterhouse Report. The Revenue Commissioners’ initial dealings, therefore, with Mr. Lowry, stemmed from those revelations and from subsequent statements Mr. Lowry made in the Dail. Of course, while the original Investigation Branch involvement in Mr. Lowry’s case (and in the associated cases of Garuda his company) was prompted by those revelations, they have, since that time, since 1996, been conducted against the backdrop of Judge Buchanan’s inquiry, the McCracken Report and the evidence to date at this Tribunal. Shortly after the Revenue became aware, as did other members of the public, of the newspaper revelations concerning Mr. Lowry’s relationship with Mr. Bernard Dunne, his then tax agents contacted the Revenue Commissioners with a view to bringing to the Revenue Commissioners’ notice certain omissions from or errors in the returns of income that had been made on behalf of Mr. Lowry in previous years. When I say “returns of income,” I include all of his tax affairs and the related tax affairs of Garuda; in other words, tax under various headings, not just Income Tax but including, also, Capital Acquisitions Tax, Residential Property Tax, Value Added Tax, Corporation Tax, and so forth. From a very early stage, the approach of the Revenue Commissioners to dealing with Mr. Lowry’s affairs involved a consideration of three important issues: The first of these was to ascertain what tax apparently due by Mr. Lowry had not been paid in the light of information which became available from the Price Waterhouse Report, from the inquiry conducted by Judge Buchanan and other inquiries, and from information made available by Mr. Lowry himself through his tax agents and by way of his statement to the Dail. That was the first issue – assessing the amount of tax due. Next, the Revenue had to decide whether, in approaching Mr. Lowry’s relationship with them, he ought to be dealt with on the basis that he had made a voluntary disclosure. This issue arose because the letter or communication from his tax agents informing the Revenue Commissioners of errors and omissions in returns did not come to the Revenue’s attention until after there had been certain disclosures in the press. The next issue was whether Mr. Lowry had exposed himself to the risk of criminal prosecution; whether, in other words, there was a question of criminal culpability in relation to his tax affairs. These three issues have complicated the relationship between Mr. Lowry and the Revenue Commissioners. Firstly, the relationship is complicated by the fact that there are differences between Mr. Lowry and his tax agents on the one part, and the Revenue Commissioners on the other part, as to how much is actually due. In other words, there are differences between them as to the resolution of the first issue – how much tax is due. Mr. Lowry has indicated that the total amount of undeclared income is in the order of in or about £500,000 and that includes the cost of works carried out on his house at Glenreigh, Holycross, County Tipperary. The Revenue Commissioners take the view that the amount of undeclared income is greater than that and may be up to £700,000, but there are genuine differences of opinion to be resolved between them. I should say that Mr. Lowry has, in fact, paid, on account, a substantial amount of tax, in excess of £300,000. Apart from the fact that in dealing with the Revenue Commissioners, Mr. Lowry’s tax agents would wish to treat any information they provide to the Revenue Commissioners as constituting a voluntary disclosure; in other words, they would wish to deal with the tax issues on the basis that they would ultimately lead to a settlement, a simple contractual or commercial settlement, perhaps similar to the kind we have heard discussed in evidence here in connection with Mr. Haughey. Because the Revenue Commissioners took the view that there could be a question of criminal culpability that relationship has been complicated, as I stated, and that is because, in dealing with an individual after an issue has arisen as to criminal culpability, the hands, both of the Revenue Commissioners and of the taxpayer’s advisers, could be tied. Again, we had references to that in the case of Mr. Haughey’s relationship with the Revenue Commissioners in the evidence that was given last week. In Mr. Lowry’s case, things went even further and it would appear that, at one point, the Revenue Commissioners took the view that they should formally deal with Mr. Lowry’s affairs on the basis that a criminal investigation was in being. Having taken that step, the Revenue Commissioners, in fact, went so far as to caution Mr. Lowry. A caution of this kind is something that is given so as to warn a taxpayer that admissions he might make or that might be made on his behalf could, in certain circumstances, be used against him in a prosecution if, at the end of the day, the Director of Public Prosecutions decided so to prosecute. That issue, the issue of criminal culpability, is a live one. As I said, the issue of voluntary disclosure is a live one, and the issue of the quantum of tax is a live issue. None of those issues has yet been resolved and are in the course of being resolved. Mr. Lowry’s historical relationship with the Revenue Commissioners involved mainly his local district office at Thurles, and the Tribunal will hear evidence from Mr. John Hussey, Senior Inspector of Taxes and District Manager of the Thurles tax office, in relation to his dealings with the Revenue Commissioners over a number of years. 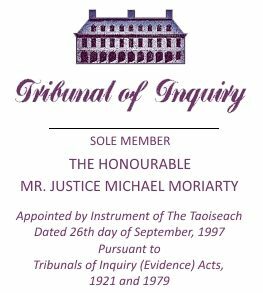 During the years which are the primary focus of the Tribunal’s inquiries, that is from 1987 to 1996, the Thurles branch was responsible for Mr. Lowry’s tax affairs, although responsibility moved to the Inspector of Taxes, Public Departments on a number of occasions. As I think was mentioned in evidence at the Tribunal on earlier occasions, this latter department is responsible for the PAYE taxation affairs of the members of the Oireachtas. During those later years, Mr. Lowry’s personal tax principally arose under Schedule E as a PAYE employee of Butlers Refrigeration, and subsequently of Garuda and as a member of the Oireachtas. In later years, Mr. Lowry was also liable for tax on rental income generated from certain investment properties. Prior to 1991, it appears that Mr. Lowry, in common with the vast bulk of PAYE taxpayers, had not engaged the services of a tax agent and had omitted to make returns for a number of years; that is to say, had omitted to make returns of income during the period when he was a PAYE taxpayer. In August of 1991, Messrs. Oliver Freaney & Company, Chartered Accountants, telephoned the Inspector of Taxes, Public Departments to say that they were acting for Mr. Lowry. Under cover of a letter of the 23rd April, 1992, Messrs. Oliver Freaney & Company furnished returns of income for the years 1987/’88, 1988/’89, — 1989/’90, and 1990 itself. As has already been mentioned on a number of occasions in the course of recent sittings, there is nothing unusual about a PAYE taxpayer making late returns, or, indeed, as appears from evidence from a number of officials of the Revenue Commissioners, failing to make any returns at all. The Tribunal has been informed that no action was taken by the Revenue Commissioners to prompt the making of the outstanding returns in April of 1992 and that no request was issued either to Mr. Lowry or to his tax agents asking that these returns be submitted. The returns of income filed in April of 1992 disclosed income within the scope of the PAYE code from Mr. Lowry’s private occupation, initially as an employee of Butlers and subsequently as an employee and director of Garuda Limited and from his state emoluments as a member of the Oireachtas. Following their receipt, the returns for each of the four years were reviewed and, as a result of that review, it was found that Mr. Lowry was entitled to a tax refund, and a net refund of £850.27 was issued to him in July of 1992. On the 28th January, 1993, Messrs. Oliver Freaney & Company submitted Mr. Lowry’s returns of income for the years 1990/’91 and for 1991/1992. Those returns disclosed the same sources of income and, following their review, appropriate tax refunds were issued. The Thurles district took the case over for the year 1992/’93, and while the return of income was submitted to the Inspector, Dublin PAYE Number 2 District (a new District which included the former Public Departments) they were processed by the Thurles branch. Following the Finance Act of 1992, Mr. Lowry, as a director of Garuda Limited, became a chargeable person for the purposes of self-assessment with effect from 1992/1993 tax year. The Tribunal has been informed that, in accordance with standard Revenue procedure, the returns for that year and the subsequent years were processed on a non-judgmental basis, meaning that the returns were accepted on their face but could be selected for audit at a later stage. The returns for ’91/’92 and ’92/’93 disclosed Mr. Lowry had purchased certain properties. The manner in which those properties were financed was disclosed in correspondence from Mr. Lowry’s tax agents, and in each case the Revenue Commissioners were informed that the properties had been financed by building society or bank loans. Mr. Lowry became a government minister at the end of 1994 and the responsibility for his tax affairs passed to the Dublin PAYE Number 2 District. The return for the year ’93/ ’94 was received at the end of January ’95 with an assessment issuing in February of that year. The return of income for the year ’95/’96 was received on 4th September, 2000. In addition to Mr. Lowry’s PAYE income, the returns for each of the years ’93/’94 to ’95/’96 disclosed rental income from an apartment property which had been acquired in October 1991, and also from 35 acres of land attached to Glenreigh which had been purchased by Mr. Lowry in May of 1992. When information on the Dunnes Stores payments to Mr. Lowry became a matter of public controversy, then, as I already mentioned, his tax affairs from in or around December 1996 were taken over by the Inspector of Taxes Investigation Branch. The Tribunal will also hear evidence from Mr. Hussey in relation to the taxation affairs of Garuda Limited, trading as Streamline Enterprises. This was the company beneficially owned by Mr. Lowry and its business was the provision of refrigeration services. It featured in the Report of the McCracken Tribunal as the recipient of certain payments from Dunnes Stores. It appears that the accounts and returns of Garuda were also prepared by Messrs. Oliver Freaney, Chartered Accountants, who were Mr. Lowry’s own tax agents, and the filing of the accounts with the Revenue Commissioners was accompanied by standard audit certification issued by Oliver Freaney. Returns for Corporation Tax, Value Added Tax, PAYE and PRSI in respect of the company’s employees were filed fairly promptly and taxes were also paid regularly, though not always precisely on time. Mr. Hussey has informed the Tribunal that he screened most of the company accounts that were filed with the Revenue Commissioners. Based on the information which was then available to him, he had no reason to doubt that the accounts, which were supplied with an auditor’s certificate, showed the correct turnover earned by the company. Mr. Hussey was also aware, on the basis of local knowledge, that Garuda’s business was exclusively with Dunnes Stores. As the company appeared to have a single customer, it would have been a relatively straightforward exercise for the company’s auditors to crosscheck the figures with Dunnes Stores, and accordingly, for taxation purposes, the company was regarded as low risk. As of December 1996, Garuda had been short-listed for a comprehensive PAYE/PRSI audit. With regard to PAYE/PRSI remited to the Revenue Commissioners by Garuda as an employer, an annual reconciliation was carried out between the figures for wages shown in the company’s accounts and the wages shown on the P 35 annual return of employee’s pay and tax. The company had also been the subject of a number of VAT audits and examinations. It would appear that on each occasion that such a VAT audit or examination was carried out, a VAT refund was claimed and there was a full review of the basis upon which the refund claim had been made. As in the case of Mr. Lowry’s own personal taxation affairs, once the controversy surrounding the payments by Dunnes Stores entered the public domain, all of the records relating to the taxation affairs of Garuda Limited, as with those of Mr. Lowry, were forwarded to the Investigation Branch. For 1993, it was shown as having a market value of £115,000. For 1994, it was shown as having a market value again for £115,000. And in 1996, it was shown as having a market value of £125,000. In support of that valuation of £115,000, the return stated that the property had been purchased for £155,000 in 1993, but of course, it included 35 acres of land and an adjustment was being made, and indeed as is usually made, to distinguish between the agricultural land and the residential property itself. For 1993, a revised valuation of £90,000, which was, in fact, of course, less than what had originally been submitted. For 1994, a revised valuation of £220,000, which was a substantial uplift. For 1995, a revised valuation of £240,000. And for 1996, a revised valuation of £275,000. Those revised valuations were agreed and, as a result of that revision of the valuations accepted by the Revenue Commissioners, the net additional Residential Property Tax and interest due was calculated at £4,831; that’s £4,831, was the net additional tax and interest due by Mr. Lowry. And that was, in fact, included in the in excess of £300,000 which Mr. Lowry has already paid on account.